Dudley MP Ian Austin has hit out at UKIP after the party’s leader Nigel Farage was caught on camera calling for the NHS to be run privately. A newly-released recording of Mr Farage shows him saying “I think we are going to have to move to an insurance-based system of healthcare”. He added that he would be more “comfortable” if healthcare was opened up to the “marketplace”. He told his audience that he was “being completely honest” about it. 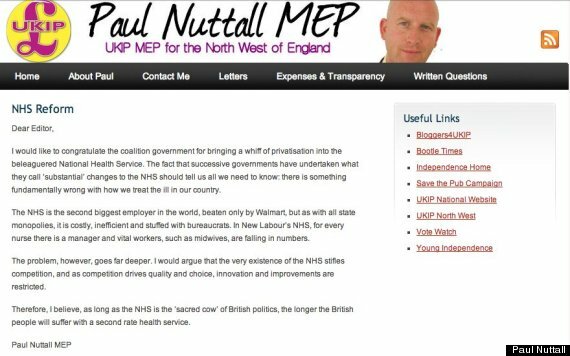 UKIP Deputy Leader Paul Nuttall has also praised the Conservatives for bringing a “whiff of privatisation to the NHS”. Austin has said that the comments prove that Russells Hall hospital is not safe in UKIP or Tory hands. “Nigel Farage has admitted the truth: he wants to privatise the NHS, bring in an insurance-based system and leave people in Dudley relying on an American-style system where the treatment you get depends on the insurance you can afford. “Both UKIP’s leader and deputy leader are saying that they want to put the NHS up for sale. “They would go even further than the Tories who have already pushed £12 million debts on our local hospital and are forcing local people to wait longer for everything from emergency treatment to chemotherapy. “Contrast that with Labour’s record: a brand new hospital at Russells Hall with more doctors and nurses treating more patients than ever before. Now we’re promising to employ 8,000 more doctors and 20,000 more nurses paid for by a tax on homes worth more than £2 million.